When Alan asked if I could help with this episode to be honest at first I thought why! Then I heard Andy’s story and deep down something resonated with me. Earlier this year I too underwent lower bowel surgery and in truth it was 30 days of hell, something that I would not wish on my worst enemy. 8 hrs a day in a hot bath just to try to ease the pain , any distraction a text, an email, a what’s app chat absolutely anything to help distract your attention from the pain. In Andy’s case it’s quite obvious that I got off lightly. I truly hope that the oven that I have hand crafted will bring some joy and memories of time spent with friends. When I started making ovens and burners way back in 1999 I wanted to help people get back to basics. No television distractions and a chance for the whole family to get out there sitting around an open fire or oven doing things together and restoring the art of conversation. I know that when you get that fire going and you can smell the wood smoke you start getting creative about the things you can cook and that whole experience it truly memorable. I’ve been told that Andy and Rachael love cooking and just so that they don’t end up cremating the food that they cook I’ve also arranged for them to go on a cooking course at the Manna from Devon Cooking School. 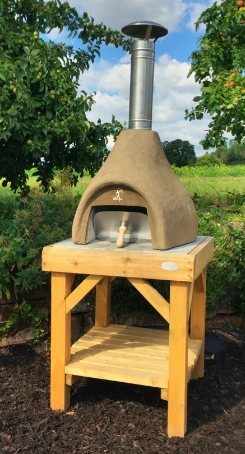 David and Holly are just as passionate about wood fired oven cooking as I am, and they have fantastic courses where you can really learn the basics to impress your friends and they are great teachers to. 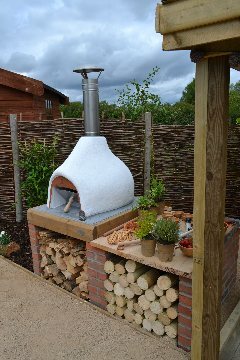 If you are interested in one of my Hand made ovens then we do have a special offer for you. The oven shown in the show is a small onion shaped vertical exit oven, it normally comes with a 1 m high wooden stand . But because Andy will need to sit down to enjoy it we mounted it on a lower wall. For you however the higher wooden stand is the perfect thing to set up one of our ovens quickly and easily. We will also send you an elementary toolkit and the flue pipe seen in the clip so it really is a complete package. If you want to order one straight away and just can’t wait to get one in your garden then please give us a call on 01905 621636 or order online below and we will get right onto it. The oven will arrive on a pallet and the driver will be responsible for getting it off his truck and as far into your garden as he can, but please note that he cannot set it up for you for that you will need to get some friends around you will have seen that this can easily be achieved by 4 burly blokes, as demonstrated in the love your garden clip. Please click on the link below so that there is no confusion as to what we can and can’t do in relation to delivering your order. Every Bushman wood fired oven is individually hand made to order. They are not mass produced in molds but lovingly hand craft as a result delivery is 4-5 weeks from order based on demand.